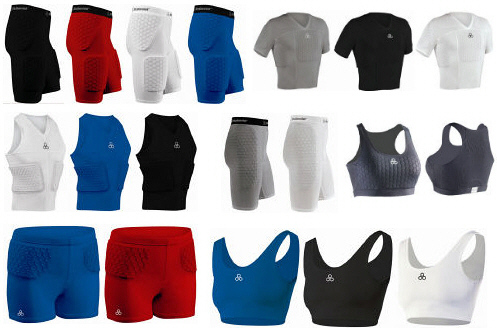 Bio Skin compression shorts offer a significant advance over other brands. They supply superior compression to the groin and hamstring without the bulk of the typical compression shorts. Perfect as cold weather gear in football, track and cross country. Ideal for virtually all sports or activities where support and protection from muscle strains and pulls is important. For protection from muscle strains. Keeps you drier and more comfortable even during the toughest workout, and results in increased performance and a more efficient use of your body's energy budget. Bio Skin compression shorts with groin wrap or cinch strap provide all the benefits of the regular compression shorts along with an added groin wrap or cinch strap. McDavid's Womens Sliding Shorts are a Pro Style Compression short that protect the legs and buttocks from abrasions common from sliding in such sports as softball. They conform to and stretch with your body for continuous protection. The compression fabric supports large muscle groups to reduce muscle pulls and fatigue. The Volleyball shorts with HexPads strategically placed over the hips to reduce hip pointers and abrasions common in Volleyball. The compression fabric supports large muscle groups to reduce muscle pulls and fatigue. These body hugging pants are designed to be worn under clothing and feature a double tummy panel. Provides excellent post-surgical support and compression for surgeries around the abdomen, buttocks, flank area, hips, thighs and knees. Available in white or black colors. Athletic shorts attached to a back support. "Stays put" Lets you move while reminding you to use proper posture and body mechanics! Available with or without magnets. Grid of hexagonal mini pads absorbs impact and dissipates energy across the surface area. Ideal for contact sports such as basketball, volleyball, football, rugby, soccer, and lacrosse.